Sparkle Cat Rescue, Inc. (SCR) is an all-volunteer, nonprofit 501(c)(3) foster home based feline rescue group dedicated to saving the 'forgotten felines' through our foster and adoption program, and assisting with TNR (Trap-Neuter-Release) in the Triad of North Carolina, and education on the importance of spay/neuter. ​The DONATE button at the top of our page (under the banner) allows Facebook users to easily donate in three taps or less to our organization using credit card information saved in their personal Facebook accounts. Our organization can also add Fundraisers to our Facebook Page for general support or for special fundraising campaigns. Supporters can also create Fundraisers for our organization and tap into your Facebook community to raise money for Sparkle Cat Rescue. Friends can donate in a few taps without leaving Facebook, making it easier to collect donations. Help us find new supporters! Each time someone donates they are prompted to share and invite their friends. Shares and re-shares also contain a DONATE button making it easy to donate right from the News Feed. Facebook does not provide the mailing address of our donors. We are only provided names and donation amounts. Donors can share their donation with their friends. Donors are sent Donation Receipts via email from Facebook Charitable Giving. Donors can view their Payment History under Settings > Payments. 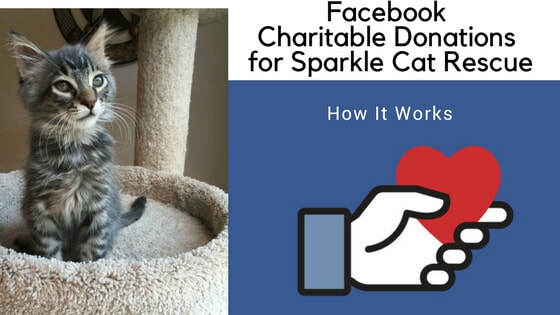 "Currently donors can not filter their charitable giving from consumer payments made inside Facebook, but it’s very likely that in time Facebook will improve Payment History to filter donation history and include year-end tax receipts, gamification, special thank you’s, etc.​"
HOW DO THE DONATIONS GET TO SPARKLE CAT RESCUE? Donations are direct deposited into our bank account and we are able to download a transaction report from Facebook. If you have any concerns about a donation you made via a 'donate' button, you may check with us to be sure we received your donation. Sparkle Cat Rescue's processing fees are 5% and funds are wired to our nonprofit’s bank account every two weeks. ​Donations to Sparkle Cat Rescue are tax-deductible. If you need a receipt, please contact us at sparklecatrescue@gmail.com; however you should receive a receipt from Facebook Charitable Giving for your tax purposes. ​Please note - this is our locked mailbox only. We do NOT have a facility.